Get caught up in the shopping frenzy at the SM Kids’ Fashion Warehouse Sale from July 26 to 28, 2013, 10 AM to 9 PM at Megatrade Hall 3, SM Megamall. 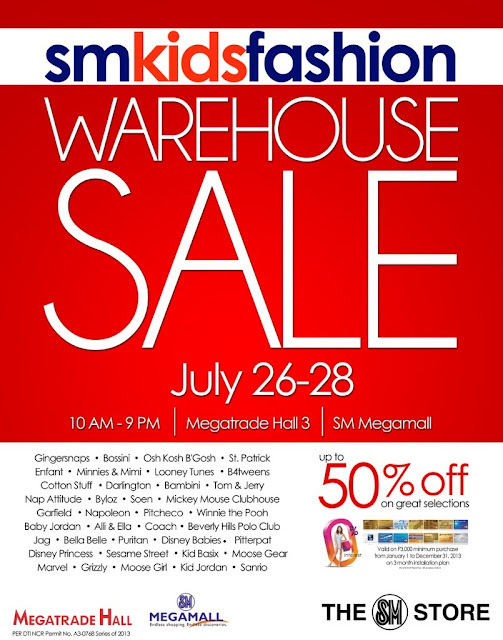 Big labels hit rock-bottom prices at the SM Kids’ Fashion Warehouse Sale. There’s no better place to pile up on the latest, cutest styles and funky kid-friendly necessities. Visitors can scoop up school gear, apparel, accessories and more at 50% off on regular store prices. Prepare to get carried away by huge discounts with a 0% interest plan on 3-month installment payments from January 1 to December 31, 2013 on selected credit cards.